Rhum JM must surely have the rare distinction of being the only distillery located in the shadow of an active volcano, Mount Pelee. Rhum JM oldest distillery still producing on Martinique, and an iconic brand of the Rhum Agricole style. Drinkers should expect rich nutty notes of butter and toffee, with a slight citrus aroma and a chewy mouthfeel. In fact, the volcano is probably responsible for some of JM’s typical style. The volcanic soil on which the the distillery’s estate is built is incredibly fertile, making it perfect for the growing of sugar cane. Indeed, the distillery grows all the sugar cane it uses in the Habitation Bellevue estate, found a little further up mountain. Habitation Bellevue is the perfect location for growing cane, not just because of the soil, but also because of the warm climate, humid sea air and altitude. Despite this, volcano life has its downsides: prospective disasters aside, the added altitude means that whilst there is a greater yield of cane crop, the sugar content is lower, meaning that more crop has to be used when making the rum. Rhum JM’s cane itself is of great interest. They grow three different types of sugar cane, whilst following the Appelation d’Origine Controlle, the stringent rules that the French government implements, controlling the production of Rhum Agricole. JM give themselves even stricter rules, ensuring that all cane is pressed within an hour of being cut (of course, only fermented cane juice can be used to make Rhum Agricole). The volcano also provides an excellent source of filtered spring water, rich in minerals, that JM use to create their rums. Whilst most other rum producers burn their fields to increase fertility of the soil, the AOC rules prohibit this. Instead, JM uses a crop-rotation system instead, swapping their fields between sugar cane and banana, which they believe to be an important part of the products eventual flavour. Rhum JM produce 2000 litres of sugar cane juice, and half a million litres of rhum agricole a year. The juice is moved into large open fermentation tanks, where they are fermented for 24 hours with yeast, resulting in a sugar cane juice wine of around 4-5%. Rhum JM distils in Creole column stills, an adaption of the Coffey still, with larger trays to increase the amount of time that spirit spends in contact with the still. This creates the esters that are essential for the character of the Rhum Agricole. The rum is distilled to 72% ABV. Rhum JM matures its spirit in charred and scraped ex-bourbon barrels, employing a solera system within each vintage to ensure that the rum maintains continuity. The distillery even chars through igniting high-proof rum! The heat of the tropics and the humidity of the island means that the rum loses more rum volume to evaporation than distilleries in colder climes, though this may also speed up maturation times. 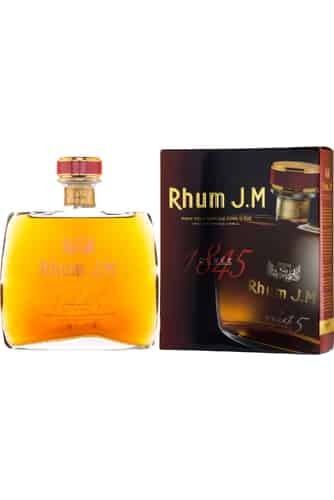 Rhum JM has also been known for its single and multi vintage releases, and finishing in Armagnac and Cognac barrels. 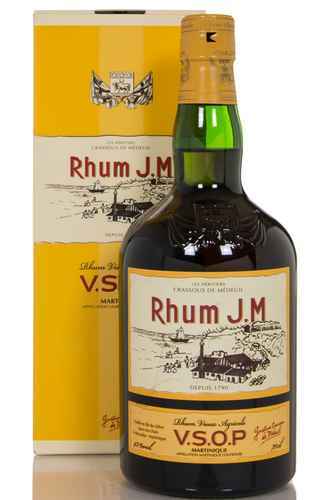 Rhum JM follows the Cognac system of age-statements, using V.S.O.P. and X.O. on their bottles. Rhum JM can trace its history back to 1790, making it one of the oldest distilleries still in operation in the Caribbean, and the oldest in Martinique. In this year, a one Antoine Leroux-Préville bought the land from Father Labat, and renamed it Fonds-Préville. As with many rum distilleries at the time, it was primarily a sugar refinery, and any distilling that did occur was likely to be a sideline to this main purpose. In 1845, the land and refinery was sold by Leroux-Préville’s daughters to Jean-Marie Martin, who shifted the emphasis on to rum production. He was so proud of the exquisite Rhum Agricole he produced that he placed his initials on every bottle – hence, JM. In 1914, a man named Gustave Crassons de Médeuil purchased Fonds-Préville from Ernest, his brother, and added to Bellevue, the estate he already owned, where JM’s cane is grown to this day. The Crassons vowed to continue the good work of Jean-Marie Martin. Like Martin, the Crassons were extremely proud of the spirit they produced, so much so that they branded their barrels and bottles with their family crest, a practice that continues today. Therefore, every bottle carries the memory of the two great families of the distillery: the Crassons by crest, and Jean-Marie Martin by initials. At FineDrams we have an excellent collection of some of the finest rums from around the world, but JM ranks as up there with some of the very best, and well worth the time of every spirit-drinker.